The single greatest aviation disaster to strike Bermuda occurred over 50 years ago. 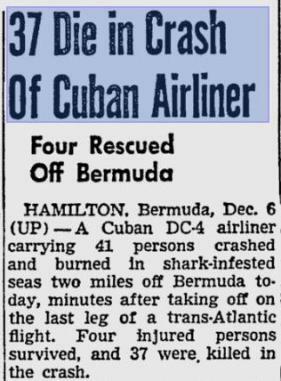 On December 6th, 1952, 37 people lost their lives when an airplane crashed directly after taking off from Bermuda. The flight, operated by Havana Airlines (a subsidary of Pan Am) was refueling during a stopover en route from Madrid, Spain, to Havana, Cuba. There were 33 passengers and eight crew on board the flight. The crew was all Cuban, and the passengers were mostly Spaniards, Cubans and Mexicans. Research seems to indicate there were no Bermudians onboard the plane. The flight arrived at Kindley Air Force Base at 3:30 a.m. and after refueling, the aircraft took off at 4:45 a.m. About a minute after takeoff, during the initial climb, something within the aircraft exploded. The plane crashed tail first into the area of St. George’s Harbour two miles—some reports say three or five miles—off Bermuda and burst into flames upon plunging in the water. Various international news reports of the day refer to Bermuda waters as “shark infested,” and said the US Coast Guard rescue boats had trouble approaching due to burning gasoline spreading over the waters. US Air Force personnel from the Kindley Base quickly scrambled jets to join the rescue efforts. According to a Pittsburgh Press report of 1952, seven people survived the crash and were rescued minutes after the plane went down. Three of the people plucked from the water died almost immediately after being rescued, leaving four survivors total. Ten bodies, described by news reports as being “charred,” were found before the search was abandoned. The remains of the other passengers were never recovered. Some news reports of the day stated that the actual crash could be seen from some parts of St. George’s. The plane was a four-engined Douglas DC-4, registration CU-T397. The cause of the accident remains unknown. There have been other fatal airline accidents in Bermuda decades ago, however detailed information is not available as they involved military planes and personnel. Available reports show at least two crashes, with fatalities of what appear to be fewer than ten Canadian and American servicemen. A local historian tells us the foreign military of the day hushed up matters of this nature.